Kingston Saints and Hawthorn-East Melbourne Cricket Clubs have both conducted Special General Meetings (SGM) and voted in favour of a merger for the 2015-16 season. The Hawks were notified a year ago that 2014-15 would be the club's last season at Monash University, Clayton. The Club, at its SGM, agreed to amend its name to Hawthorn-East Melbourne as part of the agreement reached with Monash Uni. A proposed merger between the Hawks and Dandenong fell over in February, with both clubs agreeing to walk away from the arrangement. Cricket Victoria recently received a Heads of Agreement, signed by Hawthorn-East Melbourne and Kingston Saints Cricket Clubs, which was endorsed by the CV Board at its meeting last night. 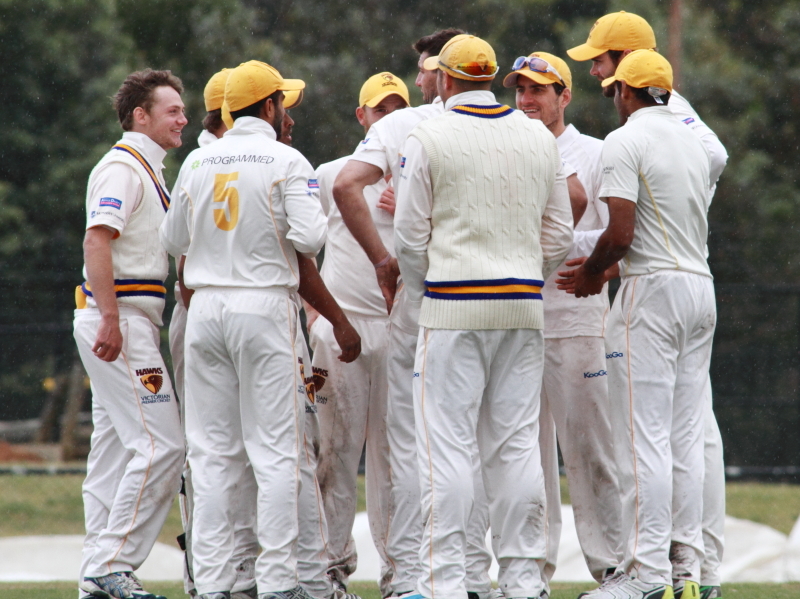 The new club, to be known as Kingston Hawthorn Cricket Club, intends fielding six senior teams in 2015-16, with a Fifth and Sixth XI playing in the VTCA. The inaugural Club President will be Petar Ivetic, who has filled that role with the Hawks over the past six seasons. The club has also appointed Ryan Ninan as First XI Captain, whilst a Senior Coaching announcement is expected within the next two weeks. The Club's main oval will be Walter Galt Reserve, on the corner of Davey and Victoria Streets in Parkdale. Kingston Saints CC was established in 1994, the result of an amalgamation of St John Vianney's and St Bedes Old Collegians to become St Johns-St Bedes CC. Up until 1994, both clubs were affiliated with the Federal Districts Cricket Association but, following the amalgamation, joined the VTCA for the 1994-95 season. In 2003-04, under the new name of Kingston Saints, the club was accepted into Sub-District ranks along with Bundoora-Old Paradians. Hawthorn-East Melbourne has also had a circuitous route in District/Premier Cricket. Hawthorn merged with East Melbourne in 1921 after the strong East Melbourne CC lost its ground (swallowed up by the Jolimont rail yards). HEMCC was based at Glenferrie Oval until 1989, when the club relocated to Central Reserve, Glen Waverley. Prior to 2001-02, the club merged with Monash University CC.